The latest way to use bananas? Snack-time sushi. 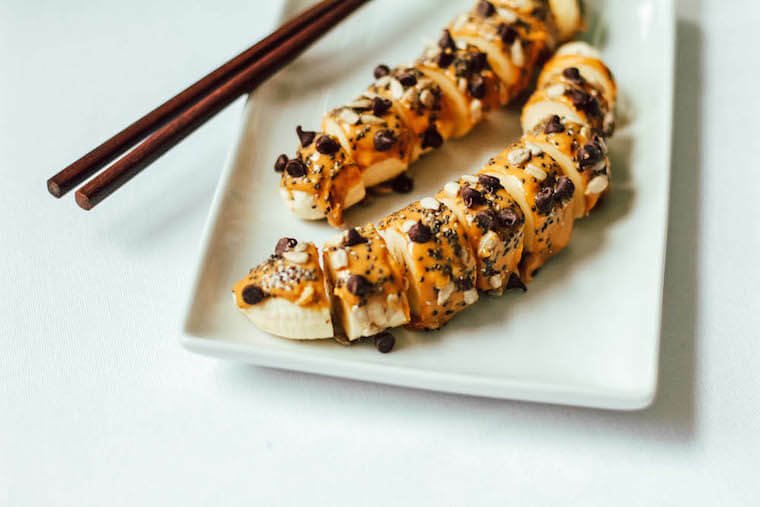 Topped with almond butter, chia, sunflower seeds, and chocolate chips, just think of it as your go-to banana with peanut butter—majorly elevated. This recipe comes from health fitness specialist Stacy Kennedy, co-founder of Wellness Guides and contributing expert for healthy-eating-made-simple site Lighter. Ready to give a classic hand roll a sweet makeover? Scroll down to learn how to make banana sushi. 2. Spread almond butter across top of the banana and sprinkle with chia seeds, dairy-free chocolate chips, and sunflower seeds. 3. Slice banana into thick circular pieces. 4. Eat with chopsticks or your fingers! Need another reason to slather on the almond butter? Healthy fats are key to longevity. Or if you’re looking to whip up more crazy tasty recipes, check out this summery watermelon pizza!